The National University System, which includes National University, John F. Kennedy University, City University of Seattle, WestMed College, The Division of Pre-College Programs and the Sanford Education Programs, was founded on the notion of universal access to education, to fostering a seamless approach to lifelong learning, and above all, to student success. One of the instrumental ways we foster student success is through the collaboration of institutions and people across the System, and I’m pleased to welcome a talented new member to the team, Mr. Seth Odell. Seth joined the National University System on April 4 as the new Vice Chancellor of Marketing. He brings a wealth of experience in the field of higher education, and specifically in serving adult learners. I am excited to have Seth join me along with the dedicated Presidents and leaders System-wide to create more educational opportunities for our students and positively impact both local and global communities. I am thrilled to announce that the National University System has just received the largest donation in its history. 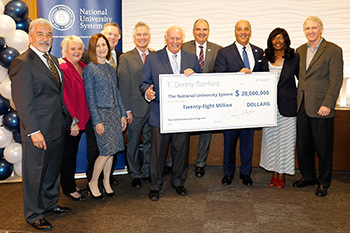 Philanthropist and entrepreneur T. Denny Sanford has generously donated $28 million to our nonprofit university System so we can further our role in leading the national expansion of Sanford Harmony, Sanford Inspire and the Sanford Institute of Philanthropy. These three educational programs, based on the vision of Denny Sanford, provide innovative, research-based solutions designed to address critical needs in teacher education, PreK-12 instruction and nonprofit fundraising. Through the System’s expansion of the Sanford Education Programs, we remain true to our values, which is building a better tomorrow through education. We are so honored that Denny has chosen us to carry out his vision and we are dedicated to ensuring the positive impact of the Sanford Education Programs will last for generations. Chancellor Cunningham meets with students at one of the System’s international education partners in Vietnam. Another example of the System’s strategic initiative to deliver market-relevant programs and meet the needs of the community is the partnership of National University and John F. Kennedy University to deliver Teacher Education Programs. Addressing the need for more elementary, secondary and special education teachers, National University’s Sanford College of Education, which prepares more teachers for credentials than any other university in California, is expanding its offerings to the JFK University campus in Pleasant Hill. Faculty from National University will lead two master’s degree programs: a Master of Science in Special Education and a Master of Education in Teaching. Currently, National University offers on-site courses in the Bay Area through the San Jose campus, but this partnership provides NU students and faculty access to on-site services and resources at the Pleasant Hill campus. Students at JFKU, which is regarded for its psychology programs, counseling centers and law program, will also have access to these Teacher Education Programs. As the System continues to serve local communities, it also maintains a global reach through programs at City University of Seattle. 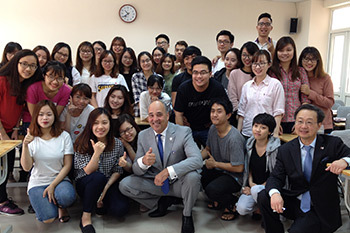 I recently traveled to Vietnam on behalf of City University of Seattle, which has a very successful relationship with Banking Academy of Vietnam (BAV). BAV offers diplomas, bachelor’s, master’s, and doctorate programs in business, finance, banking, accounting, and management information systems. I enjoyed meeting students at this institution and learning more about their experience. As I continue to look for initiatives that benefit students across the System, I am eager to explore opportunities to expand the program so that National University and John F. Kennedy University can participate, either directly or through pathways from City University of Seattle. Administrators, faculty and staff throughout the National University System remain dedicated to meeting students where they are and helping them to achieve their educational goals. By working together to create these types of cross-institutional pathways, delivery options, and degree choices, we can extend our reach of supporting student success and giving back to the communities we serve.